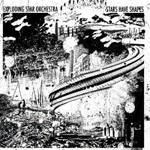 This release by the Exploding Star Orchestra is one of those rare examples of a present day unit able to travel to other places. Under the direction of cornet player and composer Rob Mazurek they've come up with a program of music which incorporates advances outside of the jazz tradition even while it strikes an extraordinary balance between established precedents and developments still in the process of fruition. Thus the collective voices on "Ascension Ghost Impression #2" are notable for the degree to which individual ego is negated in favor of group identity. Indeed the maelstrom of the first nine minutes of the piece is settled calmly, almost wanly in a passage of limpid beauty before the former reasserts itself and the electro-acoustic constructions Mazurek is credited with come into their own. The work of drummers Mike Reed and John Herndon ensures that the music at this point isn't lacking momentum, but again the entirely unselfconscious avoidance of the obvious ensures that when things pan out again it's in a tranquil direction, shot through with unease. Indeed that's underscored by agitation, as if the musicians are acutely aware and appreciative of the implications of fashioning spontaneous form. Set against this the galumphing quality of "ChromoRocker" highlights how Mazurek leaves himself open to any and perhaps all positive influences. The quality of funkshot through with a contrarily limpid qualityensures that the music remains resolutely earthbound for all of vibes player Jason Adasiewicz's sleight of hand. "Three Blocks of Light" is the place where balance is the key, especially so given the fact that the music settles down to become an embellished hypnotic drone before it concludes. Flautist Nicole Mitchelll's contribution at this point is a statement of what she can do in a setting as rarefied as this, where the balance between elements improvised and composed results in music both meditative and unsettling. "Impression #1" closes things out and it is in essence a summary of what's gone before, albeit a summary notable for its own reflective air, balanced against a measure of agitation in the form of Greg Ward on alto sax. But as with the rest of this program a simple description of proceedings does little to address the totality of the music, which is something else besides being one beautifully realized program. Track Listing: Ascension Ghost Impression #2; ChromoRocker; Three Blocks of Light; Impression #1. Personnel: Rob Mazurek: cornet, director, composer, electro-acoustic constructions; Nicole Mitchell: flutes, voice; Matthew Bauder: clarinet, tenor saxophone; Jeb Bishop: trombone; Jason Stein: bass clarinet; Greg Ward: alto saxophone; Jason Adasiewicz: vibraphone; Matthew Lux: bass guitar; Josh Abrams: bass; John Herndon: drums; Mike Reed: drums; Carrie Biolo: gongs, vibes, percussion; Jeff Kowalkowski: piano; Damon Locks: word rocker.